Asset Manager Discovery Edition (DE) for ChangeBASE offers software discovery, recognition and metering capabilities that allow your organization to significantly reduce the time and costs associated with application migrations. Asset Manager DE discovers installed applications and compares them against an extensive software catalog, then automatically normalizes and categorizes the software to reduce manual effort. Additionally, it analyzes application usage so you can pinpoint unused applications that can be retired from use. Combined with the application compatibility testing and remediation capabilities of ChangeBASE, Asset Manager offers a powerful solution for managing the entire lifecycle of an application migration project and provides ongoing management to ensure continuous application readiness. Intelligent Software Recognition Successfully identify and categorize more than 85% of all software found without any manual intervention. The Asset Manager Software DNA Database contains more than 400,000 software packages, including bundles, so that you can even differentiate between editions of common software. Software Normalization and Categorization Automatically normalize software titles to eliminate redundancy and separate commercial software from freeware, hotfixes, and other categories. Software Identification If your software isn't in the Software DNA Database already, you can upload the DNA pattern to us, and we'll identify it and add it to the next update. This can even be set to happen automatically, keeping you on top of new software coming into your network. 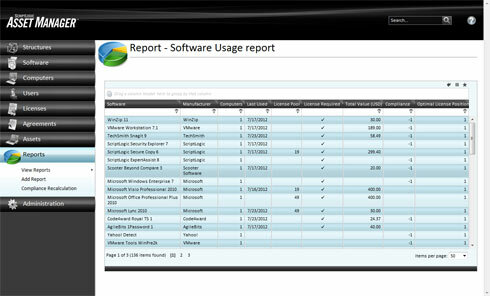 Usage Metering Asset Manager DE's software metering can track when and how often software is used. Understanding what software is deployed as well as what is actually being used is vital to ensuring only the necessary applications are retained through the migration. Removing unused software can save time and money during the migration, while also reducing licensing and support costs in the future. Inventory from SCCM & Altiris If you've adopted Microsoft SCCM/SMS or Symantec Altiris Deployment Solution, Asset Manager DE will collect the necessary asset information directly from the SCCM or Altiris database, eliminating the need to install Asset Manager DE agents on the desktop. Use existing inventory and usage data from your Microsoft SCCM or Altiris environment directly in Asset Manager DE and benefit from the advanced software recognition, categorization, and reporting capabilities that Asset Manager offers. Active Directory Integration Asset Manager DE integrates directly with Active Directory, letting you use OU, Group, Site, and User information for assigning applications and computers.